Playing through Sacred Earth – Promise left me puzzled about certain aspects of how it came to be, but the game made more sense after I took advantage of some information made available after beating it. This material includes several of the developers leaving messages about its genesis, and the most important point seems to be that earlier Sacred Heart titles were made that set up this universe. None of them ever saw release to the public though, which may account for why there is such a large cast of characters in a title that will be completed in less than ten hours. The attempt of Promise to meld an indie visual novel’s styling with tactical combat is admirable, but it’s not a title I can wholeheartedly recommend to all players. Priel is a highly skilled warrior with a carefree attitude that either irritates or endears her to all others. Despite her acknowledged combat prowess, becoming an official member of the Vanguard force responsible for protecting the citizenry has eluded her due to flippant tendencies and a refusal to complete the necessary groundwork. 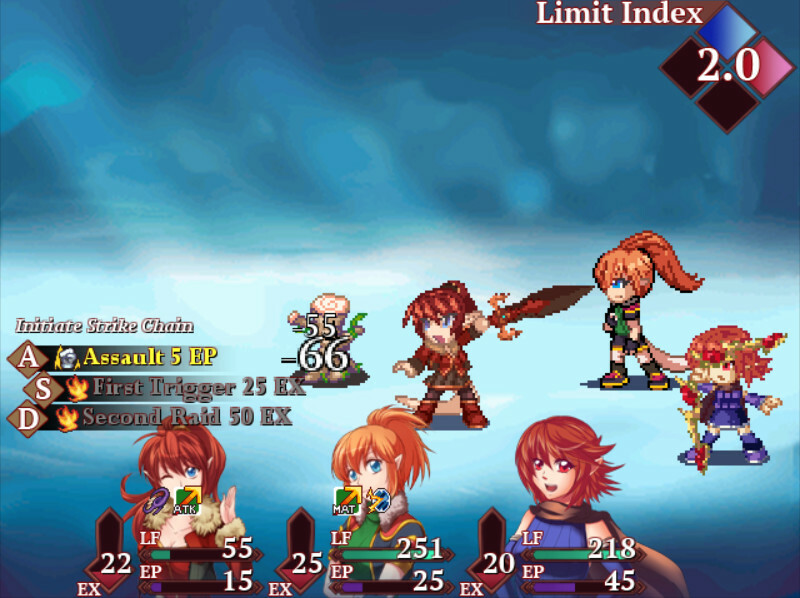 Finally serious about tackling the job, Priel proves unable to find anyone who is willing to join her for the final challenge except her sister Perrine. The sisters have a strained relationship and cooperating for even a short period of time is an ordeal, but a variety of strange circumstances compel their impromptu partnership to continue despite the disagreements. Sacred Earth – Promise definitely holds involving text that remains interesting to read throughout. Its characters will frequently engage in chats with witty banter that is amusing to read, and Priel and Perrine’s personalities come into solid focus as a result of the extensive time spent with them. Other characters don’t get to be as well-depicted but nevertheless have intriguing dialogues to absorb the player’s attention. An example of this tendency is Relima, the third party member whose apparent vampirism is made light of but never really explained. Some dungeons just pop with visual splendor. This isn’t one of them. The presence of earlier Sacred Earth material in the form of test games never released by the developer perhaps explains references to events that are not covered in sufficient detail to make them come alive. Having so many characters with whom the player must converse doesn’t have much of a payoff when a number of them don’t contribute substantially to the narrative, while a few who do figure prominently still receive insufficient attention to come alive as well as the leading sister duo. Several larger concepts aren’t addressed enough to make them stand out to the player, and a few others are teased in the postscript as sequel fodder. One character in particular is stated to have a profession involving equipment production and modification, which makes the absence of any currency or shop system bizarre. All equipment is instead found through dungeon exploration or chats with other characters. The menu functions for dealing with this gear are fortunately quick and easy to comprehend, but the inability to acquire anything to supplement what is provided free of charge rankles. Combat is turn-based, but with a number of wrinkles to the usual formula that require some familiarization. There is an action component to the proceedings, as certain moves must be used with a button press after initiating a different action. Basic physical attacks lose their usefulness as the game progresses and various special techniques become the means of achieving victory. Since defending regenerates some of the stamina needed to take actions, a character cannot use it in consecutive turns. Another tactical element arises from there being no way to revive downed characters, who instead automatically return to battle after several turns but cannot be used in the interval. Oh no, not attitude! The early ’90s will not be stopped. The intention was to make something akin to a tactical title’s combat, and that does come across in the result. A few important elements of a tactical game that would help the player out are unfortunately missing, particularly any kind of combat analysis or the ability to study an enemy beforehand. There are times when it appears that the player may have initiated a counterattack by the enemy, but without any text describing exactly what just took place on the battlefield it is difficult to be sure. The player will also have to manually keep track of what elemental affinities enemies possess due to the lack of information displayed when selecting targets, even those which have already been vanquished. 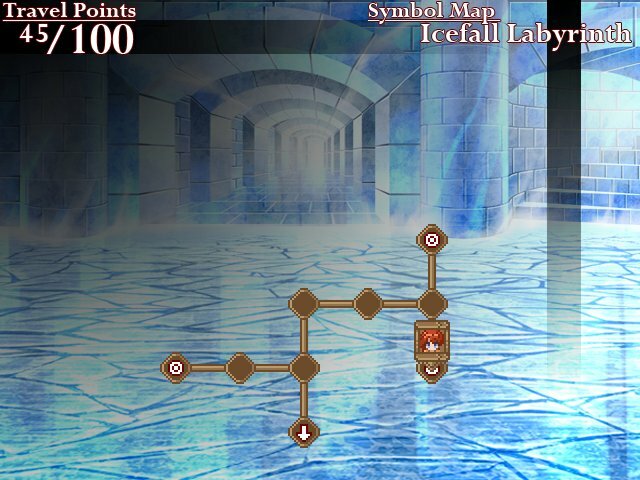 Sacred Earth – Promise features plentiful dungeon exploration, most of which is in the style of a board game wherein the player moves between spots on a map. These spots contain either enemy encounters, spoils, conversations, text-only traps, or exploration points. The occasional exploration point’s appearance is interesting, as it allows movement around a small dungeon area with visible items and adversaries. Being able to enter a few of these exploration points makes the sparseness of overall dungeon exploration stand out much more. Another issue derives from the lack of controller or mouse support, forcing use of the arrow keys for a game that does not feel akin to earlier PC titles in any other way. An inanimate log may not look very threatening, but it won’t let you pass without a fight. 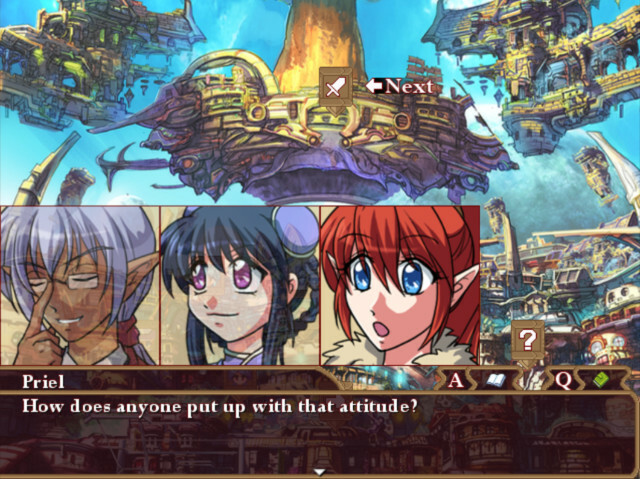 Character art and design is credited to seven different people, and it shows in the enticing artwork depicting various events throughout the game. The cast itself is also lent quite a bit of personality solely through the images used to depict them. This is necessary given that most other visual materials are functional but no more, though the sprites in battle are large and appealing. A group called Dragonic Symphony composed the surprisingly lengthy score which features multiple dungeon and battle themes, all of which are appealing to the ears. The only audio issue stems from a programming decision to emulate playing music on a physical disc, wherein the track comes to a close and has to start again. It’s difficult to recommend Sacred Earth – Promise as a standalone title, though certain aspects are definitely laudable. Perhaps once sequels are created to flesh out the world more it will be seen as the precursor to a venerable series. I enjoyed many of the witty lines and appreciated the combat’s intentions, but this is not the rare indie title which will immediately garner acclaim from everyone.